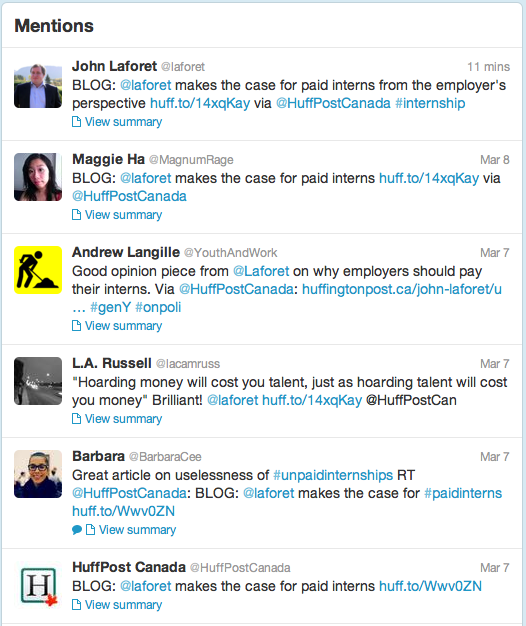 Broadview’s Principal, John Laforet, wrote a column for Huffington Post Canada arguing in favour of employers paying their interns. What is interesting about the piece is that he avoids the very basic arguments like ‘it’s the right thing to do’ or ‘how can interns pay their bills without a pay cheque?’ and gets right to the heart of the issue for employers — it makes perfect business sense to. In writing this piece, John Laforet also clarified under what conditions unpaid internships are legal, and demonstrates how limited the benefit of such an internship is for either party. If you’re a student who is considering internships, an employer who is considering hiring interns or anyone who knows someone in either situation, I am sure you’ll find John’s take on the issue of unpaid internships enlightening and informative. 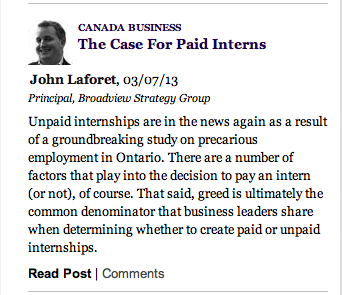 What makes the piece so interesting is John argues that ‘greed’ guides employers who pay interns as much as it guides those that don’t. Unpaid internships are in the news again as a result of a groundbreaking study on precarious employment in Ontario. There are a number of factors that play into the decision to pay an intern (or not), of course. That said, greed is ultimately the common denominator that business leaders share when determining whether to create paid or unpaid internships. Here is some feedback on the piece from Twitter. Lindsay Macaulay is a researcher at Broadview Strategy Group, based in our Toronto office.